Most homes in our area are heated by forced hot air gas furnaces or steam boilers and hot water systems. What type of system do you have? Some of the benefits of using gas: Plentiful supply is assured by the local gas supplier, greater price stability, the equipment is quieter, generally requires less service than oil equipment, and no electricity-consuming oil burner is needed, clean burning fuel – with no worry about oil spills, no underground tanks! There are several ways to increase the efficiency of your heating and cooling system. Make sure your thermostat is working properly and that all of your duct work system is properly sealed. Clean and vacuum air registers to allow for the best possible circulation in the room. Allow for adequate ventilation in the attic to let excess heat escape and insulate it to reduce the amount of heat that enters living areas below. 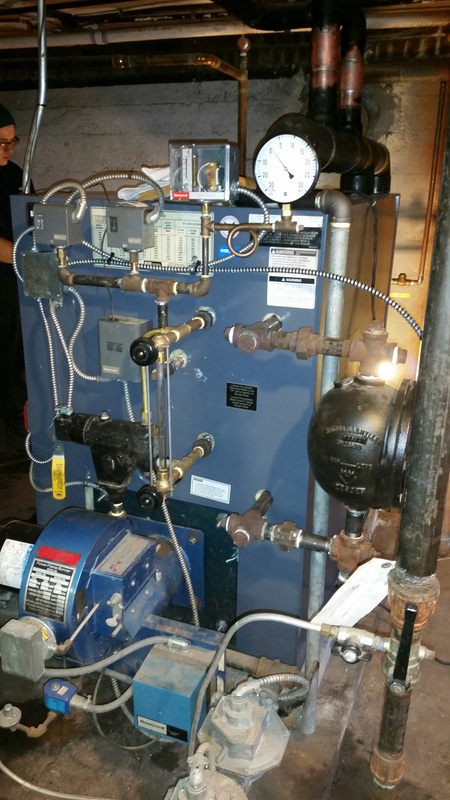 If your furnace or boiler is 10 – 20 years old, and you are experiencing discomfort or high utility bills AireCool Mechanical Inc, can help you evaluate your existing system. Often it will be more cost-effective to improve house insulation and air-tightness, repair or insulate duct work, or tune up your system. Thermostat not working or a blank screen showing? Water leaking constantly from blow off valve, or back flow preventer (gold color brass valve)? Thermostat not working or shows a blank screen? Is furnace not staying on long enough to heat your home? Keeps going on/off and you need to keep resetting it through your power switch? The typical household can save between $262 and $477 a year. Prices nationally have fallen about 75 percent since July 2008 and are expected to remain low for the immediate future, barring unexpected disruptions or global developments. AireCool Mechanical has completed hundreds of Successful Conversions! When evaluating your fuel source for heating there are many factors to consider. AireCool Mechanical has extensive experience in all aspects of converting to natural gas. We provide a complete” one stop” service from site evaluation, presenting options, securing the permits, and installing the new equipment. Rapid installations-keeps your family warm. Applying for permit applications required by the town. Local service provider paperwork filled out and administered. We coordinate tank removals if required. Provide free chimney analysis to insure your family’s safety. (3) Investing in converting from one fuel to another fuel. The report then details which measures produce the best returns for consumers. Programmable Thermostat – With a return of up to 124%, this is one of the cheapest measures, yet produces the biggest bang for the buck. Ceiling Insulation – Since most of the heat rises through the attic, more insulation can provide a 41% return on investment. Flame Retention Burner – Changing the burners in older oil systems to new flame retention burners can provide a 34% return on investment. In examining the different heating equipment, the CECA report determines that the age and the efficiency level of the consumer’s old equipment makes all the difference. Many older oil and gas systems are significantly less efficient than modern systems, so upgrading a system more than 15 years old could produce excellent fuel savings and a positive return on the investment. Furnaces – Consumers with older gas and oil furnaces can achieve returns of up to 25% by upgrading to modern high efficiency equipment. Boilers – Consumers with older gas and oil boilers can achieve returns of up to 15% by upgrading to modern high efficiency equipment.